After the rush and bustle of the holidays, it’s nice to sit back, relax and … save some money! Rainbow had a great holiday season, but now it’s time to start making room in anticipation of the busy spring season. Right now, save on clothing, toys, jewelry and gifts during Rainbow’s After Christmas Sale! Jackets and Vests, 40% Off! Sweatshirts at 25% Off! 40% Off all gifts, home décor and jewelry! Hurry in before January 14th, and check out the deals. Winter is barely started, so there’s plenty of time to enjoy a warm Carhartt jacket or cozy sweatshirt, but the deals and the jackets won’t last long! 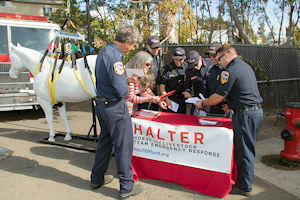 The HALTER Project – Horse and Livestock Team Emergency Response — was established to provide rural communities with information and resources for horse and livestock emergencies. The program partners with our local fire districts to help bring critically needed resources and information to Sonoma and surrounding counties. Learn more about the HALTER Project, including how you can become involved, at their website, www.halterproject.org. Join in the fun at the January Jamboree-Equine and Wine event, on Friday January 19, 2018 at the Lake County Fairgrounds. There will be demonstrations, vendors, a kid’s area, tack swap, raffle, food and drink and live entertainment! Also, local wine tasting! The event is free to the public and starts at 5 pm. This family-friendly evening is hosted by the Lake County Horse Council, a group that has done much to promote the horse industry in Lake County. Vendor space available! For more information, check out their flier, or their Facebook Event Page. It’s never to early to start preparing for this summers shows and fairs! Rainbow Ag is pleased to offer an evening Show Success Seminar for our 4H and FFA livestock exhibitors, on February 2nd at the Lake County Fairgrounds. In association with Baumgartner Club Lambs, Honor Show Chow and Weaver Leather, this seminar covers feeding, fitting, management and showing for goats, cattle, swine, or sheep. This free clinic will also include some great free giveaways! Check out the flier for more details. Trivia: December Winner is Linda Lutjens, with the correct answer that in One Horse Open Sleigh, the sleigh was “upsot” when the horse went onto a snowbank. January question is, The January Jamboree—Equine and Wine event is being put on by …. ENTER HERE! This entry was posted on Sunday, December 31st, 2017 at 3:05 pm	and is filed under News, On The Right Lead Newsletter. You can follow any responses to this entry through the RSS 2.0 feed. Both comments and pings are currently closed.